Fish. Kayak. Explore beaches, the local swamps, the barrier islands of Georgia, the Altamaha and Satilla Rivers. We don't need a campsite - we have a mothership! The Capt Gabby is a floating base camp, where the captain and crew are well-equipped to explore in just about any way. The crew will cook for you, or you can bring your own food and cook in our galley. With room for only 6 participants, you are guaranteed to have plenty of attention and care. Contact us at captgabby@gmail.com to start planning your adventure! We depart from the waterfront city of Darien at 85 Screven St, Darien, GA 31305. In a few hours we get to enjoy the scenic beauty of this coastal town, historic marshes, and tributaries of the Altamaha River. 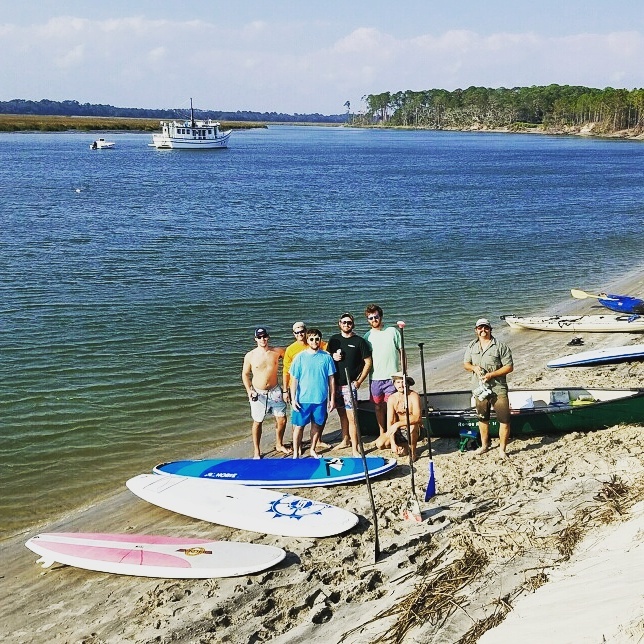 On a full day trip there is the option to kayak, explore coastal beaches, fish, or travel upriver into the lovely cypress swamps. *We have a minimum charter cost of 5 folks, and can only have 6 maximum. If you do not have at least 5 in your group - join a few other folks for the ride - or pay the minimum of 5 participants and have the boat to yourself! Spend your days paddling with nature, and spend your nights being lulled to sleep by the gentle rock of the mothership, and then watch the sunrise from our rooftop deck. We use the Capt. Gabby as a launching point to explore remote beaches and creeks by kayak, and we customize trips for fishing, birding, kayaking, photography, and more! See a sample itinerary for a three-day kayaking trip and learn more about our meals. We have a minimum charter cost of 5 folks, and can only have 6 maximum. If you do not have at least 5 in your group - join a few other folks for the ride - or pay the minimum of 5 participants and have the boat to yourself! Prices listed are per person. Want to plan a trip or ask a few questions? Fill out our Trip Planner Questionnaire, and we'll help you customize a trip that's just right.